Nutrition is complicated. Sort of. One thing that really frustrates me as a fitness coach is when people make things either needlessly complicated OR foolishly simple. Rarely do I see advice in the "sweet spot" between the two extremes. "Make sure 15-20% of your calorie intake is monounsaturated fats," is utter gibberish to all but a tiny, specific subset of people who might want to manage their nutrition. On the other hand, "eat less, move more" is one of the most patronizing, unproductive commands hurled at people who want to drop a few (dozen? hundred?) pounds of body fat. The truly aggravating thing is that each of the above statements is largely TRUE. They're just USELESS because they miss the mark so badly, at either end of the spectrum, of specificity and accessibility. Of all sub-topics within health and fitness, I think nutrition is the worst offender. And, sadly, it's by design. The reason it seems like there's a constant current of contradictory information coming at you is because: THERE IS! When you're overwhelmed by the vastness and complexity of nutritional science, it's awfully easy to buy into whatever simple solution someone tries to sell you. A detox, or supplement, or some other expensive draconian nonsense. Look, I'm not saying that sometimes nutrition isn't complicated, because it can be. If you're an Olympic wrestler who needs to lose 5.75lbs by next Thursday but still have enough energy to get in the ring and fight, yeah, that calls for some seriously detailed planning. But most of us aren't in that position. We want to look good, eat good food, be healthy, and enjoy our physical activities. That's where the one-third rule comes in. It works because it's SIMPLE, and you can put it into action IMMEDIATELY. Like, at your next meal today. OK, one-third of the pie should be lean protein. Meat, fish, eggs, y'know? One-third of the pie should be vegetables. Leafy greens, peppers, root veggies like carrots or beets, whatever you like. The final third should be a slow-digesting carb. Ideally a whole grain like rice or quinoa, but whole wheat bread and pasta are decent choices, too. That's it. I swear. If it seems too simple or too easy, then I challenge you: do it. Do it religiously for a month—should be easy, right? See how you feel. If you can do it for 30 days with 100% compliance, then perhaps you're ready for a more complicated nutrition regimen. If you can't do it with at LEAST 90% compliance (i.e., 81 out of 90 meals a month), then focus on nailing it, and see if your health and fitness don't improve, too. Below is one of my dinners from last week. Admittedly, I'm a pretty mediocre food photographer, but I like this photo because the plate really does look like a pie chart. 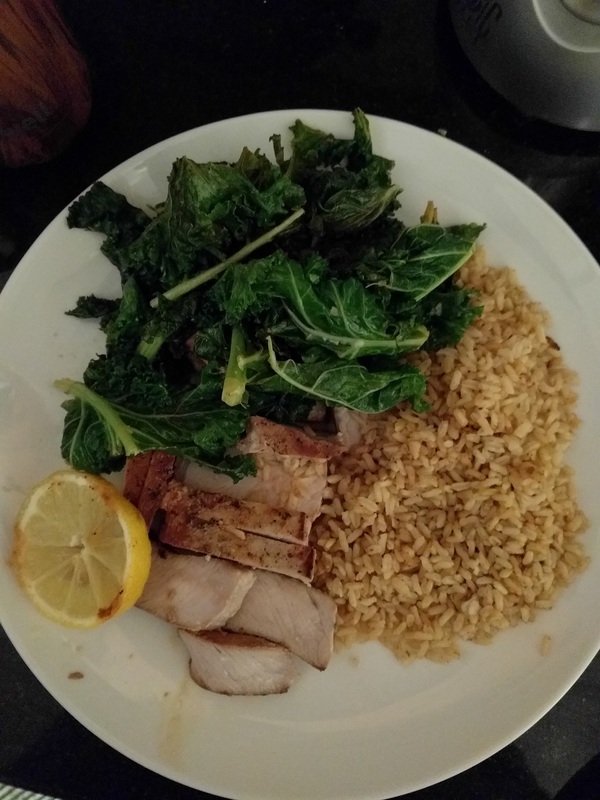 It's center-cut pork chops, brown rice, and kale sautéed with garlic and a squeeze of fresh lemon juice. Delicious and fueling. Does this make sense? Do you have any training or nutrition questions I can help with? Have you checked out Rise of the Barbell yet? Let me know how I can serve you.